Shattered Crystal Not Allowing You to See the Time? It is absolutely no fun when you accidentally break the crystal on your favorite watch, but the good news is it can be repaired. We have an expansive inventory of crystals, a strong partnership with watch manufacturers, and sources for crystals that are unusual or hard to find. If your watch crystal needs to be replaced, we have the certified watchmakers to ensure your timepiece is in good hands. Now let's learn a little more about watch crystals! There are 3 main materials used for watch crystals: acrylic, mineral glass, and sapphire/synthetic sapphire. Acrylic crystals are the most affordable and are the softest material used for watch crystals. They are shatter resistant, but they do scratch easily or even crack with a hard impact. Since it is a softer material, usually shallow scratches can be buffed out. An advantage of an acrylic crystal is it can be molded into different and unique shapes, unlike other crystal materials. Mineral Glass crystals are harder than acrylic crystals, and therefore do not scratch quite as easily, but can shatter with a hard impact. The mineral glass is the most commonly used material for watch crystals today, and the most popular crystal choice by manufacturers. Synthetic Sapphire crystals are the hardest material used for watch crystals and are often labeled as scratch resistant. They are also the most expensive. The material is lab grown, but has the same chemical composition as natural sapphire. Sapphire is the second hardest element, with diamond being the hardest. Synthetic Sapphire crystals can chip or even shatter with a hard impact. Many luxury watch manufacturers use sapphire crystals. 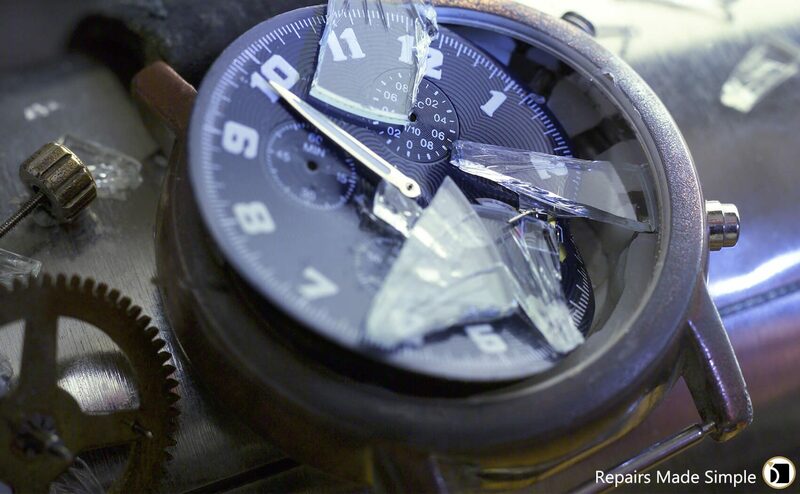 In some cases, when a watch crystal is shattered, it is important to also replace the watch movement since microscopic glass or sapphire particles can get into the movement causing damage. If you would like to place a watch crystal replacement or repair order, please click on the "Get Started" button below.